I experienced something very interesting yesterday. It reminded me ellipsis, transformation, time and change. I had to do a shooting for a project and I needed special liquid for the paint. Therefore, I went to see a painter friend of mine and took some liquid from him. We put it in a plastic glass and I left it in my room. It was early in the morning and he was just recently woke up. I didn't know anything about the characteristics of the liquid and I thought I didn't have to. He just told me how to apply it to the paint and I didn't ask anymore questions about it. After leaving the liquid in my room, I thought I might have lunch and I could hopefully do my shootings afterward. After I came back, I realized that, the liquid melted the glass and was all over the place. The plastic had a strange look. It wasn't solid anymore but became much more into something more organic. Because I didn't know anything about the liquid, I didn't realize the cause and effect. It reminded me that while I was somewhere else, something occurred in my room without my control but because of me. And this was a strange feeling. One of the things that I immediately thought was the picture above. It is taken from the book "The Story of Film" written by Mark Cousins. Here, he mentions three filmmakers from different periods, who influenced themselves and changed and manipulated the same shot within the history of Cinema. How directors learn from each other: Carol Reed has a visual idea, Jean - Luc Godard adapts it and Martin Scorsese modifies it still further. At the same time, I thought about something completely different. Storytelling and Dramatic Irony. A situation where one or more of the characters on the screen is ignorant of the circumstances known to us in the audience. 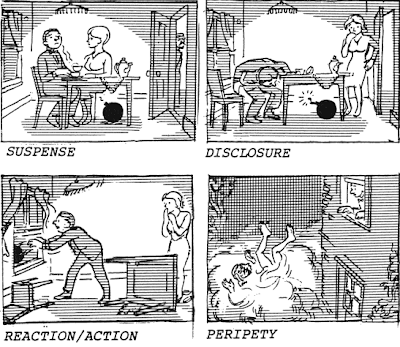 Most stories with a strong plot are built on the tension of cause and effect. Each incident is like a domino that topples forward to collide with the next in a sequence which holds the audience in a grip of anticipation. "So, what happens next?" Each scene presents a small crisis that as it plays out produces a new uncertainty. Let us suppose that there is a bomb underneath this table between us. Nothing happens, and then all of a sudden, "Boom!" There is an explosion. .The public is surprised, but prior to this surprise, it has seen an absolutely ordinary scene, of no special consequences. Now, let us take a suspense situation. The bomb is underneath the table and the public knows it... In these conditions this same innocuous conversation becomes fascinating because the public is participating in the scene. The audience is longing to warn the characters on the screen:"You shouldn't be talking about such trivial matters. There is a bomb underneath you and it is about to explode!" The American Heritage dictionary defines irony as "The use of words to convey the opposite of their literal meaning." In my case, if I am the hero in my story and the spectator is following me throughout the whole story therefore their range of knowledge is equal to what I have, than what I experience and feel is the same that the audience has. (We expect the average audience not to have any knowledge about the characteristic of the liquid.) And that creates a certain identification between the reader, audience or spectator and the character. Because I left the liquid in a plastic glass, it melted. Therefore I had to revisit my painter friend to get another one. And that was the main effect in the story. That I had to visit him again. What I realized after I went to his studio is that he already started working. I didn't really realize the time has passed and I hadn't done any work until that moment. So, I was stressed. Something also was changed during that time. That he wasn't still hangover like I saw him the last time, but he started working during the time that I experienced all of this. iyi de barbaroscum her audience, character kadar vurdum duymaz değil ki. ortada ne idüğü belirsiz bir sıvı varsa ben izleyici olarak ondan bi şey çıkmasını beklerim. özellikle onu evde bırakıp gittiyse eve döndüğünde bir sürprizle karşılaşmasını beklerim. yeni bu bende bir suspence yaratır ki bu karakterin yaşamadığı bir gerilimdir. yanlış mıyım? evet doğru diyorsun aslında ama hikayede o sıvının boyayla karıştırılması gerektiğini yazmadım. aslında boyamak için alınan bir sıvı. bu yüzden aslında tamamen masum. aynı zamanda hikayeyi yazarken sıvı üzerine çok gittim. görsel olarak düşünürsen sıvıyla ilgili sadece boya için alındığı bilinecek ve üzerinde durulmayacak. bu da seyirci üzerinde boya ile ilgili bir beklenti yaratmaz diye düşünüyorum. bu arada selamlar! bloguma hoş geldin! aynı zamanda, demek ki suspense yaratmak sadece range of knowledge üzerinden işleyen bir şey değil. dramatic vurgu da önemli. tıpkı senin hikayende olduğu gibi. ben elif zeynep yazığın şeyi seslice okuduk ve herkes ya sıvıdan bi canavar çıkmasını bekledi ya da onu birinin içmesini.